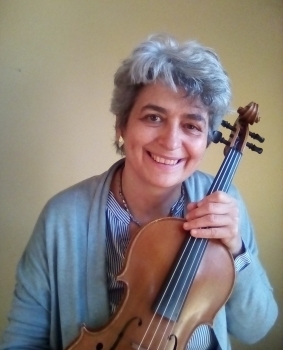 I was invited to give a presentation about the New Approach at the 43rd International Viola Congress, which took place in Cremona from 4th to 9th October. Maybe you do not know but there are many viola associations around the world. They were created by viola players to exchange information about all things related to the viola. Every year a congress is organized by one of the viola associations. It features concerts, lectures, masterclasses given by violists from all countries. A viola congress is a wonderful opportunity to meet a lot of other fellow violists, including amateurs and professional, students and professors, as well some of the top viola performers, all sharing information about their activities, viola repertoire, viola history etc. The musical level is very high but at the same time the atmosphere is very friendly and you may end up having lunch with the likes of Bruno Giuranna, Tabea Zimmermann or Michael Kugel, just to name a few. I had previously attended a viola congress years ago in Glasgow, where William Primrose was born, so more or less I knew how it was going to be and I was very honoured to be invited. At my presentation there were young students, adult players and teachers, including KHANA’s former and present Italian representatives Roberto Moro and Jill Comerford (KHANA is the Kato Havas Association for the New Approach). My presentation had to be short, 45 minutes, therefore I focused on making it lively by involving the participants. Having such a short time, I made sure I conveyed something that they could remember and apply, so I mentioned just a few aspects of the New Approach. I mentioned that I was going to give some advice on how to play more easily thanks to some of New Approach principles, rather than “better”. I talked about the optical illusions about the real length of the keyboard, especially relevant for violists more than violinists. I showed them how to eliminate those illusions, by measuring the real length of the fingerboard from the 1st to the 4th finger and I gave each participants a little piece of red string as a souvenir to remember this. We sang and clapped and I explained them how singing, before and while playing, coordinates everything and releases tension. With the help of a girl who was attending, I showed them the effects caused by the wrists when they are straight and the thumbs pushing out (tension) and the opposite when the wrists are bent and the thumbs curved inward (release of tension). I emphasized the importance of focusing on the music and telling a story, rather than on themselves and the fear of making mistakes. When I asked someone to come on stage, as it happens often, not many were enthusiastic about playing in front of others. However, I had an exceptional volunteer, Maestro Michael Kugel, who kindly contributed to the workshop in a light-hearted way. I also gave participants them some tips on how to eliminate stage fright by finding situations to play where they were allowed to make mistakes, to acquire confidence. The overall result of this workshop were participants who later told me they had enjoyed it and were very impressed by those demonstrations, like the ones about the fingerboard optical illusions and the wrists and thumbs. They had never realized such things.